It's been a while since I carried the old B&G, but looking back it's been a long and interesting career with some fantastic mentors who I met along the way. It all started one random day at a time in my life when I was just looking for a job to get me by when I found a job posting for Steve's Bug Off. I remember thinking to myself how hard could it be to carry a metal can around and spray the baseboards of a house? So off I went to for an interview, I walked into a world that I would find I loved, and got the job. I quickly found that pest control was not at all what I thought, there was a lot to learn, and Steve's was the place to be if you were looking to learn about bugs. Steve's Bug Off was the home of the famous Insectarium, a museum that housed all kinds of exotic bugs. School children would come from miles around to tour the museum, and I found it just as interested as the kids did! Steve's also held weekly training classes for other pest control technicians to come to and get their licensing credits and we were required to attend these classes. Entomologists, manufacturer reps, distributor reps, all would come in to teach us about the most current products and techniques to control insects. Aside from this I was partnered with one of my first mentors, John. He taught me a ton about the nuts and bolts of pest control, but he also taught me about the little things. I remember two things as I write this entry. One was to always grab a big handful of napkins when you are at your lunch spot and keep them in your van. The other was to go to lunch during an off time, like 12:15. The idea behind this was that folks usually go to lunch on the hour or half hour, so when you go at an off time there will be less of a wait and you get in and out. John was always on the Jazz. I am very grateful to him for his mentoring. So needless to say I stayed in the industry, read everything I could about common pests, insecticides, safety, etc, and found my way to a company called Van Waters and Rogers. Van Waters was a pesticide products distributor. It was the biggest distributor in the world and because of that we had access to great information and cutting edge products that we would sell. I started in the warehouse and was quickly promoted to an inside sales rep. The kicker was that this position was in North Jersey which took me about 2 hours to drive to and from. I figured it was a good opportunity and I was really young, so it didn't seem like the wrong decision at the time to accept the promotion. Needless to say that after about a year the commute wore on my vehicle and my social life, so I said goodbye to one of the greatest experiences of my life. I learned about the other side of the pest control industry. I learned how to talk to people, how to multitask, how to sell. I drove a fork lift and learned how to ship and receive, but it was the contacts I made who were invaluable. I got to meet a wide array of pest control technicians and owners of exterminating companies and became good friends with lots of them, many of whom I still keep in touch with today. So I bounced from South Jersey and went to work for my old manager from Steve's Bug Off who started his own business called Environmental Pest Services or EPS for short. Ted was another great mentor and someone who I got along with very well. I had so much respect for the fact that he went off and started his own business that became a success. He was good to me and taught me a lot. It was here where I learned that I was trusted and counted on to do a job and to represent EPS professionally. Ted gave me a lot of freedom and he knew that no news was good news. I had a commercial route that consisted of some of the biggest hospitals in Philadelphia, restaurants, nursing homes, and everything in between. He knew that if the job had to get done at 5AM then I was awake at 4AM and was there taking care of the account on time. I learned a lot about commercial accounts, how to interact with different levels of management and the language they spoke. I learned the importance of documentation and being neat in my work. Commercial work was much more different than residential, and that is what I learned at one of the best jobs I had. So then love and marriage came along. I decided to take a gamble and use some of our Wedding money to start my own business. I said thank you to Ted and went out on my own. It was here I found that some of the connections I made back at Van Waters would pay off. Some very generous and good guys took me under their wing so to speak and subbed out some work to me. Ted, Bill and Zap, and Nick all helped out with farming work my way. Termite work, residential and commercial. I did it all. Between this and my own work I hit the ground running and was doing pretty well. On my off time I would hustle to find more work and while doing an Internet search I found a company that needed a vendor to provide just termite inspections or WDIR reports as they are called. So we signed the paperwork and they said that they would fax the work orders over. Holy smokes did they! It turned out to be a very lucrative account. Things were good, but like all small business there were ups and downs. My wife had not found a permanent teaching job yet and was working in a daycare center. We had crappy insurance, and we were pregnant with our second child. Decisions needed to be made. With a lot of soul searching I decided to look for a permanent job and found one at the company I currently work at called NHS or Northwestern Human Services. NHS is a human services organization with close to 600 locations in Pennsylvania and surrounding states. They were looking to bring their pest control program in-house and get away from vendors. I thought that sounded interesting and applied, not knowing much about what they were looking for at the time. All they had posted was pest control tech wanted. It turned out to be one of the best jobs ever. They explained that they were looking to hire a pest control technician to report into the facilities department. What they didn't know was how to do this, they just knew they wanted to start the program. I thought this was the perfect opportunity. It was a stable job, stable pay, great benefits, all just in time for our second child being born. I set them up with all the legal mumbo jumbo they needed with insurances and getting set up with the State with BU numbers and the like and off we went. I also decided to keep my own business open for a short time and kept a few higher paying accounts that I was able to juggle on the weekend, although this didn't last very long. Since then I continued on through the ranks of NHS, my old boss retired who ran Support Services and I was hired to replace her. I managed the pest control department which grew to 3 other guys along with the other duties of the job which entailed managing landscaping, snow removal, internal and external moves, furniture storage, courier services and housekeeping. I had a full plate. Recently I moved departments and am now managing the safety of the company. I still maintain my pest control license because you just never know and pest control will always be an industry to fall back to. 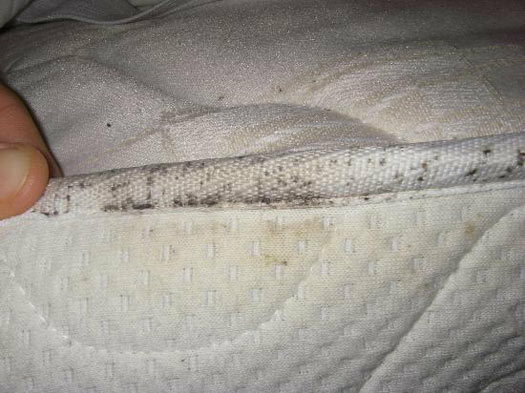 How do I know if I have bedbugs? What are the signs of bedbugs? 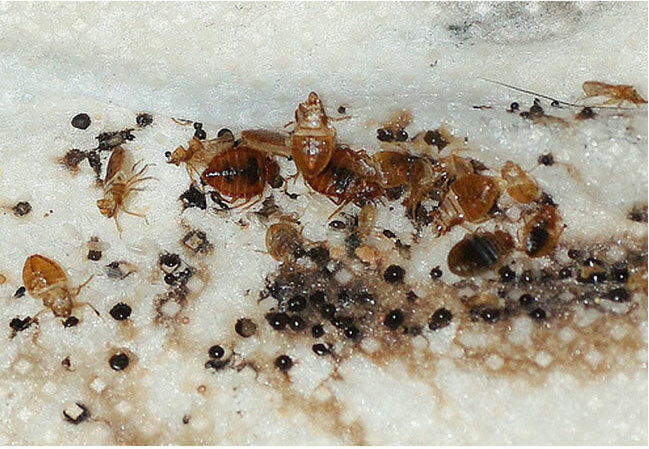 Live bugs, eggs and spotting can be very real signs of bedbugs. If you find a pocket of bugs like this in your bed then you have problems! You've pulled up to your hotel all ready for a restful vacation when a nagging thought comes into your mind. Do I have to worry about bedbugs in my hotel room? Bedbug hotspots where they like to hang out are places like dorm rooms, hotel rooms, motel rooms, and cruise ships, although you can find bedbugs almost anywhere people gather. So what is one to do? Well as crazy as it sounds, when I arrive with my family at a hotel for vacation I tell them to put everything in the bathroom. This gives you time to inspect the room. Take the covers off the bed and check for signs of bedbugs. Things like blood spots and live bugs are probably all you are going to find if anything. Check in the drawers of the nightstand, check your closets, you chest of drawers, the luggage rack, along the top of the ceiling, at the bottom of the walls, under the bed. It's a job, but it's worth it. After you are confident that you don't have to worry, you can come in and unpack your bags for the week! How's that for a question? These days it seems like bedbugs are immune to pesticides and insecticide and everything in between. So what's the deal? Well even from the very early introduction of bedbugs back into our society they have been heartier then your average bear. Having a high resistance to insecticide was the norm. Even these days there is evidence that the bedbugs are becoming resistant to the new class of chemicals that have been used to try to control them called Neonicotinoids. So just what can we do to kill bedbugs? Like in the past, it is important to use a variety of techniques. This would include using a variety of insecticides and mechanical controls to help with the remediation. Using mattress and box spring covers, pulling back carpets to dust under baseboards, drilling holes in the wall voids to dust with an insecticide. These are all tools that will help you on your path to being bedbug free. The other option to kill bedbugs is heat. Many companies these days will provide a technique where they will come into your home and raise the temperature to a certain degree above 120 where they will hold that temperature for about 3 to 4 hours. During this time period they will enter the home to move furniture around, lift mattresses and box springs, and things like that which will help to get the heat where it needs to go to kill the bedbugs. This is an expensive procedure, but very effective. When it comes to getting rid of bed bugs fast, a heat treatment is going to be your best solution. Heat treatments are a one day treatment that requires little to no preparation and offers the most effective means of elimination. The drawback is that they are also still relatively expensive. So if you are going to shell out the money for one of these heat treatments, you will want to think of a few things in advance. Lets start at the beginning, back when you got the inspection. Was it a bedbug K9 that came out to inspect or a technician? You will want to ask either one to also inspect your car if they didn't already do so. You don't want to pay all that money, leave for the day with bedbugs in your car, have one get into your shoe, and bring a live one beck into the home to potentially re-infest the whole house again. If there are bedbugs found in your car you may want to plan to coordinate the heat with a car fumigation. Some of your larger pest control companies will offer this. It takes some coordination, but the car and the house should be done on the same day. The other thing to think about is how you leave your home on the day of treatment. You don't want to put on your sneakers that may have bedbugs on them and put your winter coat on that may have bedbugs, while your wife grabs her pocket book that may have bed bugs in it and leave. All you are doing is throwing thousands of dollars out the door with a heat treatment that will fail because you brought the buggers back into the home when you returned that night. So what to do? Well, to start off, put the outfit, your sneakers, and your winter coat into a hot dryer for a half hour. When they have been heated, put the outfit in a large zip lock bag and your sneakers in the same. Put your coat in the car (assuming there are no bugs in the car) and then then next morning take your shower, get dressed in your bed bug free cloths, and leave immediately. Leave the purse behind, take only your identification and some money. This is how you have a successful heat treatment. Yes and no. Insect foggers or bug bombs as some people call them serve the purpose of releasing a "fog" of contact killing pesticide into the air with the hopes that it will contact bugs in areas that you couldn't get to while just spraying. Foggers, while initially effective, often times push roaches into deeper hiding where the fog will not reach, causing roaches to re-infest an area a few weeks down the line. They usually won't affect insect eggs either, making the problem tough to get rid of by just using the bug bombs. Insect foggers are also dangerous is misused. They can be extremely flammable and explosive and if not set off correctly it will combust. The best way to use a fogger is as a tool in an overall program. Professionals will use a fogger to flush out the roaches and get them running. Before they set the bug bomb off they will put down a residual product around the perimeter and in cracks and crevices. Then the roaches or insect will run across the residual product and die. One good application for a fogger is if you are dealing with large numbers of flying insects. A good fog can knock that problem down fairly quickly. Stop the presses and call the army. MITES! For some strange reason, people freak out over these tiny little pests called mites. There are many kinds of mites. Rodent mites, bird mites, clover mites, night mites (just kidding), scabies mite, straw mites, and chiggers just to name a few. Most of these pests can be a nuisance to humans, mostly causing itching. Luckily, mites can be treated and eliminated. Expel them from you life! Mites be gone. So how is it done? Most mites need the host to survive, like the bird mite, and some live off humans, like the scabies mite. Bird mites, chiggers, rodent mites can all be successfully treated using a vacuum and some insecticide. Removing the birds from your home if they are nesting near by will help. They may take some time to control, but they will go away. Other mites like the scabies need to be treated by doctors. So all this fear and gloom and doom is for not. No need to be scared of tiny microscopic bugs crawling into your brain. Be brave. Are Mice Living In My Bed? There is a question you don't hear everyday. Can mice live in your bed? Well let's think about this for a minute. Mice love fluffy, soft nesting material, they love warmth, they also love food and water. A bed can be all those things to a mouse if you are the kind of person who like to nibble in bed at night and watch television. Mice are opportunistic and very curious. A box spring or eve a mattress can provide a perfect home for a family of mice. I think before they would move in though they would have to have explored the rest of your home. Chances are, if you have mice living in your bed then you have a bigger problem than just the mice living in your bed. I would think that the infestation of mice has gotten so bad that mice had to leave the areas in the kitchen do to over crowding. They had to look for another frontier. This new world would be the upstairs and your bed is their cabin. So if you suspect mice in your bed then I would recommend first calling a qualified pest control company to come in and do a complete inspection and make some good recommendation for control.